Spooky story “Come Into My Parlour” finishes this week: it is a story of possession and witchcraft drawn atmospherically by Douglas Perry. The evil character in this story is an old witch, a real gruesome hag; next week sees a new story being drawn by the same artist but with the evil being supplied in by a witch-hunter, who is superficially smoother and sleeker, but just as menacing and villainous underneath. Also finishing is “Land of No Tears“, the science fiction classic that was so popular a reprint was demanded. 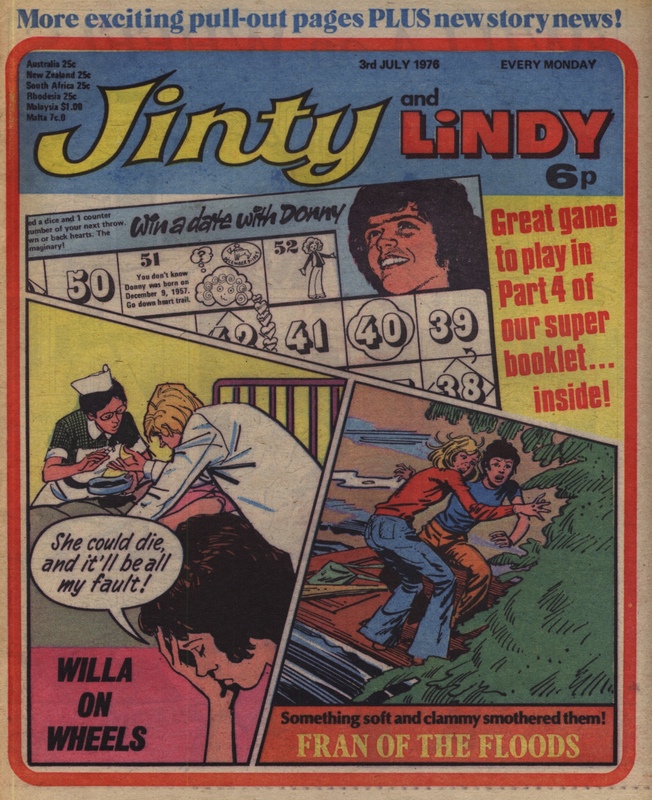 Pat Mills was clearly busy at this time, because out of the three or four stories he wrote for Jinty, two of them overlap in this issue: “Concrete Surfer” is not one covered in detail in this blog yet, though its time will come. It has great action art and a gung-ho message; a mixture of class warfare and daredevil skateboarding action. I wish I knew who the artist was! This is another cover I find very striking. It breaks away from the boxy three panel covers that started in 1976 to more dynamic layouts with the streaky lightning borders. Lori’s dark girl disguise works for her to win the race and the trophy that could be a vital clue to her past . But Lori forgot one thing about black polish on the skin – sweat makes it come off! She’s forced back to to the nasty Crabbs and now the battle with them is worse than ever because of the trophy she won. And now Miss Crabb is on the brink of finding where Lori hid it! In For Peter’s Sake!, Corrie runs into some unfriendly, snobby people who look down on her as a tinker. But then she gets quite a surprise when she and Peg run into some travelling folk who are far nicer. Fran of the Floods encounters a village where the people are even more unfriendly – to the point of threatening them with guns – although they have an injured girl who needs medical attention. In The Slave of Form 3B, there is some comeuppance for Stacey as we find she has gotten a tad dependent on her hypnotic powers over Tania. She tries to use it to cheat in a test – but finds her access to Tania blocked and she ends up with rock bottom marks! Unfortunately we know that will just make her worse than ever, and sure enough, she is now planning a terrible revenge at a swimming session. In “House of the Past”, things begin to get scary for Anna Bentley. Someone or something seems to be trying to turn her into Helen Fairley, a girl who drowned in the 1930s. Now people in the house are wearing 1930s clothes and then Anna finds her wardrobe full of those types of clothes as well! Things get even more frightening in Then There Were 3, when the girls have a magnificent feast in a supposedly derelict inn – and when they wake up next morning, they find it truly derelict! Meanwhile, it’s all happy in Bound for Botany Bay, where Betsy Tanner is finally reunited with the father she has been trying to find for so long. Now they’re all set to start a new life on a new farm – but then the past catches up in the form of Miss Wortley. And so they learn that as long as they remain convicts, they can never be truly free. And what can be done? After all, they did commit the crimes that got them transported. We realise that the conclusion of the story will have to sort this out somehow, or it will not be a happy one. 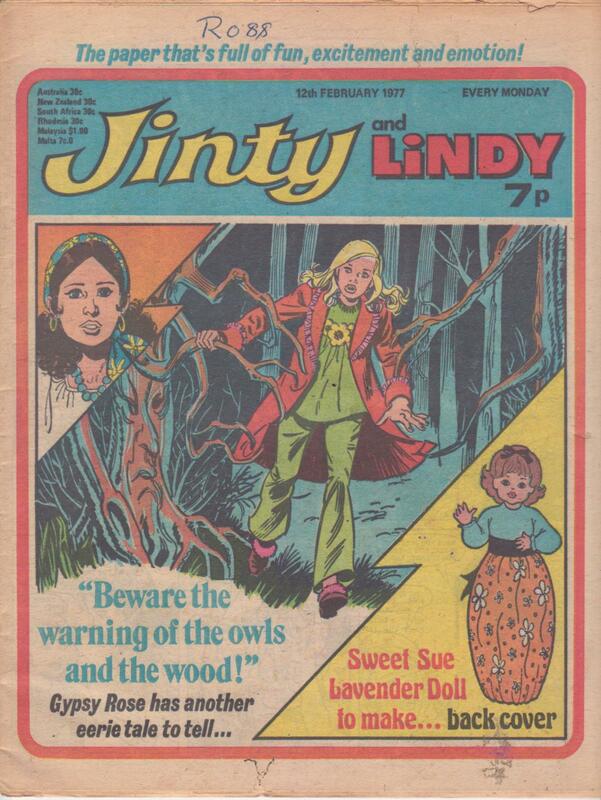 If Misty was the girls’ comic with horror stories in it, then Jinty was the one remembered for its science fiction stories. 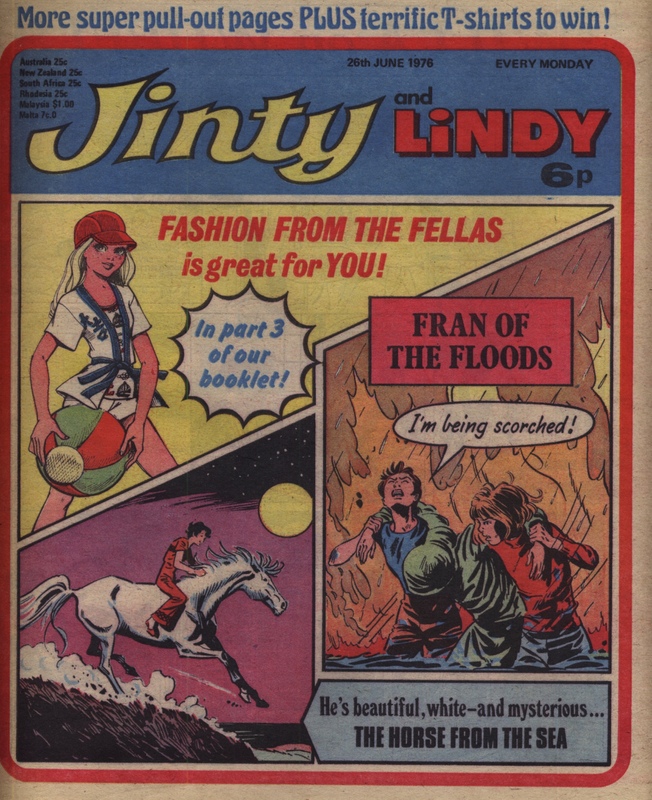 Although Jinty didn’t include sf from the very start, and was far from being the only girls’ comic title with science fictional themes, this is a justified link: the first science fiction-influenced story appeared within the first year of Jinty, and sf appeared throughout the bulk of the run of the comic, forming some of the very strongest and most memorable stories in the title. There are a number of really key examples of sf stories in Jinty, and I could choose any one of them to talk about in more detail: “Fran of the Floods“, “The Robot Who Cried“, “Land of No Tears“, “Almost Human“, and “The Forbidden Garden” are all indubitably sf and memorable stories to boot. This time I want to talk about “The Human Zoo”, which we have hardly focused on at all as yet. In “The Human Zoo”, a coachload of schoolgirls is abducted by aliens, and taken in a flying saucer (along with other, grown-up, abductees) to another planet. This planet, light-years away (everyone is put into cold-sleep to get there) has two suns, and the dominant life-form consists of the aforementioned aliens, who are bald, dome-headed, and speak only telepathically. From the alien point of view, humans are mere animals; indeed, there are wild humans living outside the alien cities who are hunted down as food and for sport. This is a good, solid sf story, taking the opportunity to swipe at a few other targets on the way (it is clearly an animal rights story too). It perhaps would fit better in the pulp years of some decades previously than in the more sophisticated and experimental New Wave of science fiction of the 60s and 70s: for instance at the end of the story, everything is reset and no lasting impact is seen from the girls’ trip to a far planet, and the aliens are pretty stereotypical. But really, you couldn’t get a story that was much more solidly in the heartland of science fiction themes. “The Green People” (1975): this is the first story I would identify in Jinty as being science fiction. I hesitated initially, as the titular green people live underground in idyllic locations that make you think more of elves than of aliens: but they have ray-guns and a special metal and an advanced civilization that has gone through war into peace. They also use that trope beloved of sf writers of a certain era: telepathy. Like “The Human Zoo”, this uses an sf theme (here, it’s a first contact story) to talk about an issue that affects our society more immediately: wanton destruction of the environment. “Fran of the Floods” (1976): this is a John Wyndham type-story done for a schoolgirl audience, an apocalypse and post-apocalypse in comics form. it is a rather cosier catastrophe than even Wyndham was ever accused of, but with pretty grim moments nevertheless and a roll-call of the dead and missing, at the end. The clock is not reset in this story, even if civilization is not gone forever. 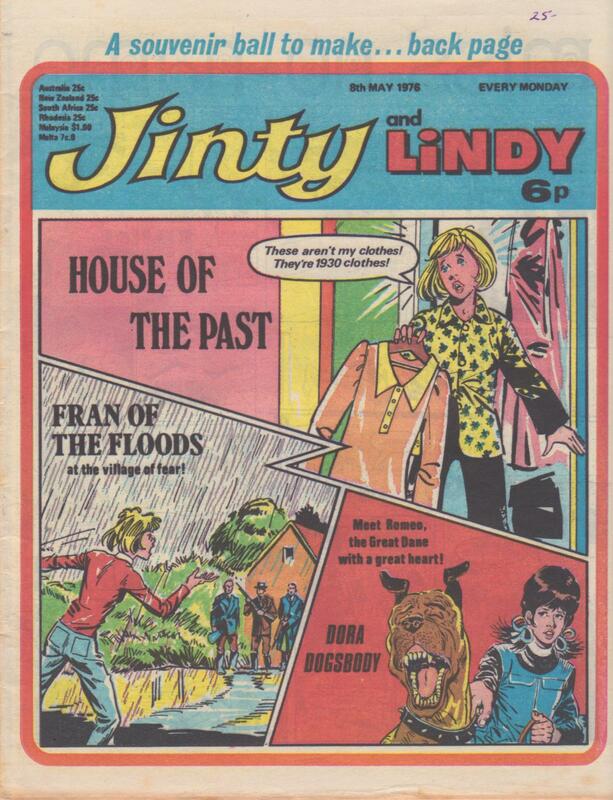 “Jassy’s Wand of Power” (1976): at the same time as running “Fran”, about climate change leading to flooding, Jinty also ran a story about drought. This disaster was man-made rather than unlucky; there is a fair amount of indicting of powerful men in the story. It is set slightly in the future, with psychic powers having been found to work and a backlash set in against them. “The Robot Who Cried” (1977): a robot is created, in the shape of a girl; she runs away from her creator and learns what it is to be human. The ‘science’ in it is daft and thin but there’s lots of good stuff about misunderstanding human motivations and society. “Battle of the Wills” (1977): the protagonist is offered the chance to have herself duplicated by an unscrupulous scientist: she jumps at it, hoping to be able to concentrate on her beloved gymnastics and getting out of having to do ballet. But which of the duplicates is the original and which the copy? And – what will happen once the experiment comes to an end? “Land of No Tears” (1977-78): Lame schoolgirl Cassie is whirled into a future world where she is classed as a ‘Gamma’, inferior girl; with her fellow Gamma girls and some other help, she overthrows this cruel order of things. “The Human Zoo” (1978): see above. “Almost Human” (1979): a cross between the Superman story and the Bionic Man, with a more emotional edge: protagonist Xenia is an alien from a dying world. “The Forbidden Garden” (1979): set in a dystopian future where pollution has killed off all plants and people live in over-crowded and oppressive cities. Laika discovers a patch of earth which is able to support life and tries to grow a flower for her dying little sister. “Worlds Apart” (1981): following a leak of a mysterious chemical, six schoolgirls are thrown together into alternate universe after alternate universe. Some of the universes are more magical than is compatible with scientific reality but the notion of alternate universes, and the mechanism for their travel between them, is in itself more science fictional than magical. “Girl In A Bubble” (1976): the very idea of a girl in a bubble, kept by a scientist in order to study the effects of isolation, has plenty of science fiction elements (not least the scientist’s name – ‘Miss Vaal’). It is done more as a slave story, however. “The Birds” (1978): there is a scientific (or at least not magical) answer behind the question of why the birds in a certain town started to attack everything, but it is more horror story than science fiction. Of course, it is a take on Hitchcock’s film. Other time travel stories: time travel into the future is necessarily science fictional as it requires construction of that future world. Time travel into the past, or time travel of a past character into our present, would typically be a historical story or a spooky story (such as in “Shadow on the Fens”, where a girl from the past escapes persecution as a witch, and a modern girl gets a friend, by making a wish on the old Wishing Tree). Of course, there were many sf stories outside of Jinty, too. “Supercats” in Spellbound features four space-travellers with special powers and many adventures; “E.T. Estate” in Tammy was a version of ‘The Bodysnatchers’, done with schoolgirls; “Tomorrow Town”, also in Tammy, tackles technological development and social pressures (Alvin Toffler’s “Future Shock” done with schoolgirls? I but jest). Particular mention should go to “The Frightening Fours”, in Judy & Emma (1979): an alien invasion story where anybody over the age of fifteen or under three is put into a deep sleep, but four year olds are given great strength, intelligence way beyond their years, organisational abilities, and made into an army to serve the aliens’ plans. Outside of girls’ comics, 2000AD was of course a comic more or less entirely dedicated to science fiction. 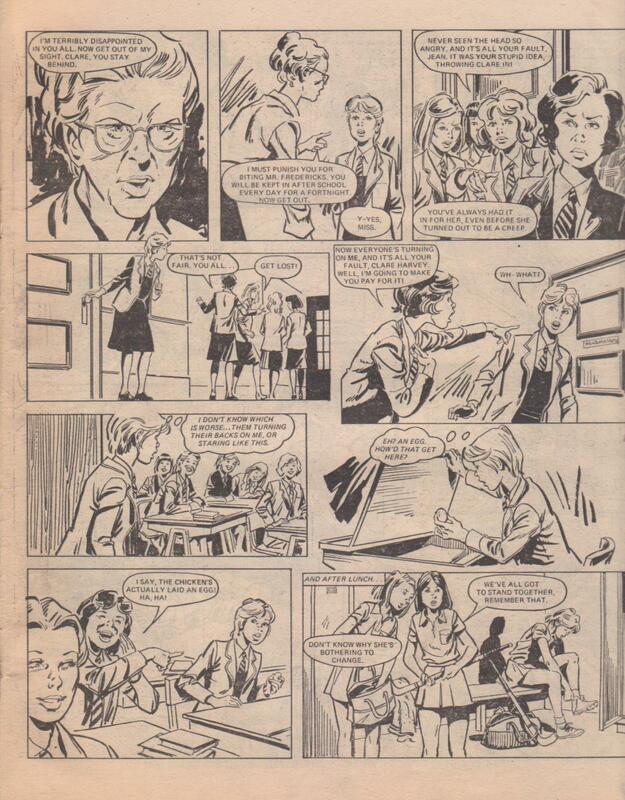 Interestingly enough, the 2000AD story Skizz (1983) – written by Alan Moore, drawn by Jim Baikie – could perfectly well have appeared in a girls comic; it even had a female protagonist, as well as a down-to-earth feel. The prevalence of science fiction stories in many comics means that we can’t only point to the same names over and again as being the initiators of this theme. Malcolm Shaw is known to have written a number of key stories in this area (“The Robot Who Cried”, “E.T. Estate”) and likewise Pat Mills wrote “Land of No Tears” and “Girl In a Bubble”; but “Tomorrow Town” was written by Benita Brown, “Fran of the Floods” was written by Alan Davidson, and who knows who had the bonkers ideas in “The Frightening Fours”! I think that if we knew the names of more writers, we’d find that many different writers in many different titles had a go at some sf story or other. Stories of magic and the supernatural often include a companion who helps, guides, prods, or sometimes rather forcibly plonks the protagonist in the middle of adventure. The companion in question has his, her, or its own agenda and in that, it has some similarities to the evil object which takes over people’s lives: but unlike the evil object story, the magical guide does not coerce or remove free will. Generally speaking, the agenda of the companion is at least morally neutral, if not positively on the side of the protagonist’s best interests. The journey towards a happy ending, though, is not in itself happy all along: often the life of the main character is made decidedly more uncomfortable as the story unfolds. Normally the companion is clearly magical, maybe right from the start: sometimes she (rarely he) or it seems outwardly normal at first but is found in the thick of things too often for it to be a coincidence. This perhaps is particularly the case where the companion is an animal, such as one of the three(!) examples of magnificent white horses that help protagonists in various ways. The example I think is one of Jinty‘s best for this theme is “Guardian of White Horse Hill”. Janey Summers is an orphan, with foster parents who she is hoping will go on to adopt her. However, life with her new family is not easy, partly because of mean snobbish girls in the local area, partly because of trauma she hasn’t yet got over (badly handled by the adults in question, as usual), and partly because, well, she sees a white horse that no-one else can see. Obviously people start questioning her sanity as well as her temperament, but the horse in question turns out to be Celtic horse goddess Epona. Epona takes Janey back in time more than once, to the Celtic settlement originally located where the modern village is. In the historical time, Janey finds herself in the body of a young priestess facing the peril of a Roman invasion; in the modern time of the story, the village is threatened by a road which is to be built through the village itself. At the priestess’s behest, the Celtic villagers saved themselves by a non-violent path, namely digging a white horse on the hillside; the earth left over from all the digging is swept into the path of the invaders by torrential rain. In parallel in modern times, the path that the villagers were going to take – giving up and giving in – is derailed by Epona, who through Janey’s actions reveals the historical white horse carved on the hill. The villagers are able to declare this a site of special interest and hold off the road-building that way. Even before Epona takes Janey back in time, she clearly reveals her magic to the reader: no-one else can see the horse apart from Janey, and when she gets on the back of the horse she is invisible to those around her. Ultimately Epona’s actions are in Janey’s interest too: by saving the village, the livelihoods of Janey’s foster parents are secured, but also Janey’s role in bringing that salvation helps to secure her wish to have real, loving parents again. There are uncomfortable moments for Janey along the way: for instance when Epona makes her dismount (so that she can then be seen by anyone who can spot her) just before a big village meeting. Even more so, you could point to the basic fact that making yourself visible to just one person is in itself asking to lead them into trouble – and Epona, magic though she is, is not a talking horse and does not explain herself. “The Valley of Shining Mist” (1975) has a mysterious woman in a mysterious cottage in a mysterious valley – only when the mist fills the valley can the protagonist see the cottage as anything but an old ruin. Debbie is taught music by the woman in the cottage, but more than that, she also learns love and acceptance as Mrs Maynard helps her to change her life. Corn Dolly in “Golden Dolly, Death Dust!” (1975-76), who guides and protects the protagonists in their battles against the evil witch Miss Marvell. The eponymous horse in “Horse From The Sea” (1976) seems initially like a normal (magnificent, unbridled, appearing-out-of-the-blue) white horse, but a tale is recounted part-way through the story that makes it clear that this is the same mysterious horse that throughout centuries has defended the heir of the local estate from danger. The mysterious Malincha in “Sceptre of the Toltecs” (1976-77) is golden-eyed, and inhumanly strong and smart. She needs the help of protagonist Jenny Marlow to fulfill her quest; you could perhaps consider Malincha to be the protagonist herself, but she is so characterless and mysterious that it is hard to see her in that role. In “Sue’s Fantastic Fun-Bag” (1976-79), the magical companion is another inanimate object: well, I say inanimate – the bag in question is given expression by the creases in the leather, giving her a cheeky look. This one is played for laughs too, and as an ongoing humour strip there is less of a clear agenda on the part of Henrietta the hand-bag as there is less of an overall story. Henrietta often helps Sue and gets her out of a pickle, but equally she often lands her in one too. In “Daughter of Dreams” (1979), Sally Carter is a wall-flower until she makes up an imaginary friend, Pauline Starr. Her imagination is so strong she can see her new friend clearly – so clearly in fact that Pauline comes to life! Pauline helps to shake up Sally’s life, first of all by getting her to do more lively things so she can make more friends, and then in the sequel, “Miss Make-believe” (1979), defeating crooks in a stately house caper. Karen finds a ghostly skating instructor in the “Spirit of the Lake” (1979-80): appearing to her as an elegant woman, the spirit is friendly and helpful to Karen in a situation where the girl is otherwise not shown much love or friendship. The skating spirit seems to have little agenda of her own other than to help Karen become a skating champion. “Gaye’s Gloomy Ghost” (1979-81) has another ghostly companion but is an ongoing humour strip like “Sue’s Fantastic Fun-Bag” (and indeed is drawn by the same artist too). “Sue’s Daily Dozen” (1980) has an inanimate object as the magical companion, making it perhaps a slight stretch from the main theme of the category. Sue finds a book in the old cottage that she has moved into with her sister: the recipes in the book turn out to be more like magic spells, but very positive and homely ones intended to spread positive effects in the local community: sweets turn out to bring the childhood sense of fun back, and a love potion reconciles a quarreling couple. None of the spells are dramatically and clearly magic until the end of the story: the ambiguity of whether the odd effects are coincidental is maintained for quite a while, which is nice. In the end the book is reunited with the cauldron that Granny Hayden had also used, and both items disappear off to be found in the future by another lucky girl. Gabbi is the magical companion in “Her Guardian Angel” (1980-81); literally a guardian angel, this played-for-laughs story has her defending her charge from all sorts of things that are not in fact dangerous. Gabbi has her own agenda: she has to pass a test to earn her wings, and earthbound Roz must therefore temper her normal way of being in order to help this angel who has become a friend. As with the other themes, you can see examples that don’t fit quite as clearly in the category but still have a lot of overlap with it. “Wild Horse Summer” (1974) has (yet another) magnificent wild white horse which changes the protagonist’s life, but this horse really does seem to be a real-life horse who behaves reasonably realistically. “The Zodiac Prince” (1978) in question is definitely magical; he is more protagonist than companion. “Paula’s Puppets” (1978) is a little harder to categorise; I’d say it was a better match with the Evil Object / Supernatural Object theme as the puppets have a less clear agenda of their own, if any. In “Pandora’s Box” (1979) Pandora has a little black magical cat, Scruffy, but he acts like a typical witch’s familiar, not as a magical guide. “Sea-Sister” (1979) has a ghostly/magical character who again is more protagonist than guide or companion. There are other stories with animal friends or antagonists – cats, dogs, horses, birds and so forth in stories such as “The Big Cat”, “The Birds”, “Blind Faith”, “The Disappearing Dolphin”, “Finleg the Fox”, “Friends of the Forest”. As with “Wild Horse Summer”, these are animals that are given a generally realistic treatment. Evil object / supernatural object, discussed separately. Mysterious helper: a story type where someone is mysteriously helping the main character, but in a naturalistic way. The particular example in Jinty would be “Diving Belle”, where the protagonist gets training in diving by a female instructor who appears mysteriously and does seem to have more-than-natural knowledge of what is needed (what with being a gypsy, as obviously psychic powers come with that). Nevertheless she is a human and interacts with the main character in a human way. Wish fulfilment: this can be magical/supernatural in nature (“Dance Into Darkness”) or through more naturalistic methods (“Jackie’s Two Lives”, “Kerry In The Clouds”). There is a trigger for the protagonist to have her wish fulfilled but that is not someone who accompanies her throughout the story guiding her. Bringing a magical companion into an otherwise ordinary girl’s life is always going to be a popular way to power a story; any reader could hold out a hope that just such a force could enter her own life and help her out with her difficulties. I guess it also makes sense that the writer can’t have the magical companion make things too straightforward for the protagonist as it’d be boring otherwise; the magical companion must therefore challenge or complicate the main character’s life as much as improving it. 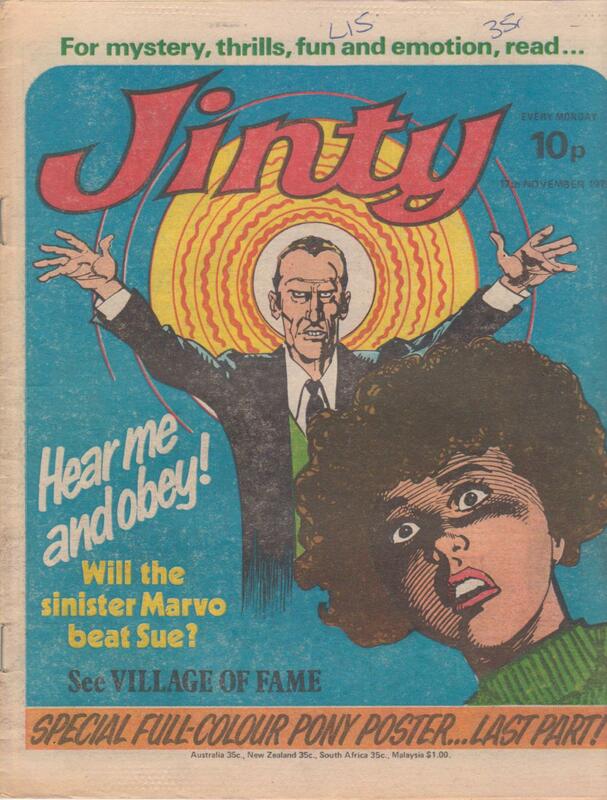 Another of my favourite Jinty covers, drawn by Jim Baikie. The creepiness of the theme is brilliantly induced by the use of complementary colours with the orange and yellow mesmeric circles around Marvo’s head and the blue background, and the cross-hatching on Sue’s face. It is, of course from Village of Fame. The story now reaches its penultimate episode, with Marvo using mass hypnotism to mesmerise the whole village into believing that Mr Grand’s TV serial is good for them. Worst of all, Sue Parker, the girl who has opposed Grand all along, is falling under the spell as well. Something needs to happen fast in the next episode! Almost Human is on its penultimate episode as well. Xenia’s mother has been trying to tell her something important but can’t get through. Then it happens with one of the moons of Xenia’s home planet suddenly exploding! Xenia is distraught, but is it all what it seems? Combing Her Golden Hair is approaching its climax, with Tamsin running off to Redruthan, her birthplace. We know that soon Tamsin is going to discover what Gran has been keeping from her all these years. Waves of Fear is approaching its climax too, what with Clare’s latest bout of panic getting her expelled thanks to nasty Jean. Priscilla Heath, the only adult who has not been judgemental to Clare, now begins to realise Clare needs serious help. The trouble is, nobody else does. As usual, Clare’s parents react with anger and harshness because they are working on the assumption that she is a coward and delinquent. And in Black Sheep of the Bartons, Bev Barton is in more trouble with her parents as well – and on Christmas Day! Reprint: Girl Picture Library 11 as “Moments of Terror” (abridged); Tina 1983 as “In een golf van angst” [In a Wave of Fear]. Dutch translation. Clare Harvey has everything to enjoy at school: success, popularity and friends. She and Rachel Mitchell are the best of friends, and now they are celebrating a special hockey victory. The only one put out is Jean Marlow, a nasty girl who has always hated Clare for some reason. In the changing room, Clare suddenly takes a strange turn and has to get out in a hurry. Nobody realises it is a warning of what is to come. Later, Rachel wants to take a swim in the pools in a coastal cave. Clare does not feel like it, but Rachel insists. In the cave pool, Rachel runs into trouble. Clare is about to go in after her when an inexplicable panic of walls closing in and waves of fear hit her. They are so terrifying that they force her out of the cave, leaving Rachel behind and still in danger of drowning. Outside is Jean, and Clare tells her what is happening, but is too terrified to go back in. Jean rescues Rachel and, having always hated Clare, puts up the word that Clare is a coward who left her friend to drown. Clare, hitherto the most popular girl at school, now finds herself an outcast, with all the girls turning on her and calling her a coward. At home, Clare’s parents are just as condemnatory, and they will get increasingly harsh with her as the story progresses. Clare can’t understand why she panicked and wonders if she really is turning into a coward. The morning assembly is honouring Jean’s heroism. This has Clare thinking of the cave, and as she does so, the same terror starts again. She feels walls closing in on her and she panics, desperate to get out. As she does so, she brings chaos to the assembly and injures a teacher and a prefect when they try to restrain her. As the confused and distraught Clare wanders through town, she discovers word has spread about her (through Rachel’s mother, who works in the markets); people stare at her, whisper behind her back, and refuse to serve her. She tries to visit Rachel in hospital in the (mistaken, as it turns out) hope that if Rachel forgives her, the terrors will stop. But the waves of fear and images of that cave overwhelm her again and she has to get out fast. She decides to try writing to Rachel instead. She heads home and finds her parents angry after the school phoned them about her conduct at assembly. They demand an explanation. Clare says she cannot give one, except that she now seems to see that cave everywhere and gets terrified and runs away every time she does. They do not seem to be impressed or concerned at this. They also insist on her going to the hospital to apologise to Rachel, but Clare is too terrified after what happened there already. They don’t listen when she tries to explain this and go to the hospital themselves, saying they don’t have a daughter anymore. Next, Clare heads back to the scene of the disaster and finds that even the waves seem to be calling her a coward. She forces her way into the cave to try to understand her panic, but it just starts up again. However, her attempt to get out is blocked by Jean and other girls. Egged on by Jean, they throw Clare into the pool in an act of bullying. Then the girls get a shock when Clare does not come up, and they discover there is a powerful current below. It looks like Clare is dead because of their bullying. Jean is all for covering up, but the others say she is the coward now and phone the police with the truth. However, the current merely pulls Clare through into another cave. Once she emerges, the panic grips her again. It takes some fierce scrambling under the rocks for her to get out. As the terror-stricken Clare runs off, she is spotted by a woman who is concerned by the state of mind she is in. She is Priscilla Heath, secretary of the orienteering club. She takes an interest in Clare for the club. At home the parents find Clare not dead as they all supposed. When the headmistress demands to know why Clare did not report her survival, the parents accuse her of doing it on purpose to spite the girls. They refuse to listen to Clare’s pleas that she had been just too frightened to think of it and the girls should not have thrown her in the pool anyway. Nor do they listen to her pleas not to go back to the school because of the bullying and they drag her back there. In the head’s office the bullies get a fierce dressing down from the headmistress and this has them turning on Jean. But this has Jean turning extra nasty and swearing revenge on Clare, who is still an outcast and a target of bullying. When Jean sees Clare getting the same panic when she gets stuck in the shower cubicle and raving about the cave, she immediately sees how she can get her revenge. Meanwhile, Clare gets heavy detention for her conduct in assembly and is on a last chance basis before expulsion. But on a brighter note, she joins the orienteering club. Miss Heath knows about the unfortunate business but unlike the others she does not condemn Clare; instead she says there must have been a reason why she panicked. Clare gets the satisfaction of beating Jean in a race at the orienteering club, which nobody has ever done before. But of course this has Jean turning even nastier towards Clare. Rachel is discharged from hospital and her parents turn up at school demanding Clare be expelled, just because they don’t want Rachel attending the same school as Clare. Outside the head’s office, Clare gives them her letter for Rachel, but unknown to Clare, Mrs Mitchell rips it up. Mrs Mitchell is furious when the headmistress refuses to expel Clare and says she will keep Rachel at home. When the girls hear of this, Jean uses what she saw in the shower cubicle to hatch a plan to get Clare expelled. Jean locks Clare in the classroom where she is doing detention and turns off the lights to simulate the cave. As Jean planned, this sets Clare off into the panic and, in her desperation to get out, she wrecks the classroom. The headmistress expels Clare. Jean then heads off to tell the Mitchells of Clare’s expulsion. Mrs Mitchell is delighted and will be sending Rachel back to school. Rachel wants more understanding of the whole business and wishes Clare had tried to contact her. She does not know Clare had tried twice and failed. As Clare runs off, Miss Heath finds her in a dreadful state and Clare explains what happened. And she says she can’t come to the club because of Jean. Miss Heath insists that she does and she will deal with Jean. She tells Clare she needs help. But at home, Clare’s parents are furious about the expulsion. They tell Miss Heath to go away and ban Clare from the club, despite Clare’s protests that it is the only good thing she has right now. Dad then locks Clare in her room. This sets off another panic and Clare escapes through the window. Now Clare is on the run and the police are after her, and her parents are under the impression they have an out-of-control daughter. She makes her way to the orienteering club, where Jean destroys her last joy by wrecking the orienteering club and putting the blame on her. Clare protests her innocence to Miss Heath, who is not sure what to make of Clare’s claims that it was Jean. But she begins to think Clare is sick. However, Clare has run off again. She heads back to the scene of the near-tragedy, where men have now started dynamiting. We now get hints that Clare is contemplating suicide, but at that point the men scare her into running again. Meanwhile, Rachel returns to school. She learns of Clare’s failed bid to write to her, and then how Jean got Clare expelled. She calls Jean a monster and rushes off to tell Clare’s parents. Miss Heath is also there, and upon hearing Rachel’s story she now believes Jean wrecked the club. She also realises what the problem is: Clare has developed extreme claustrophobia (the fear of closed spaces). The guilt-stricken parents realise that they, along with nearly everyone else, got blinded by the thought that Clare was a coward who kept lashing out when in fact she was mentally ill. They notify the police and the school. The sight of a police car forces Clare back into the cave. Rachel comes in and says to Clare that she forgives her and wants them to be friends again. But then the entrance to the cave collapses because of the dynamiting. Rachel pushes Clare outside but becomes trapped inside. Clare uses the other entrance she discovered from the bullying incident in the cave to rescue Rachel, braving her claustrophobia, the current and a collapsing cavern to do so. Rachel then tells Clare what is wrong with her. Clare is reconciled with her apologetic parents. Clare is reinstated at school and welcomed as a heroine by remorse-stricken classmates. Jean is furious (but there is no mention of her being punished in any way). The rescue of Rachel is regarded as the first step to recovery. It is a long, hard struggle before Clare is well again, but she makes it. And she also makes county orienteering champion. Phobias have a history of making plot material in girls’ strips. Lara the Loner (Tammy), A Dog’s Life for Debbie (Tracy) Cursed to be a Coward! (Jinty) and Slave of the Trapeze (Sandie) are some examples. The first deals with ochlophobia (fear of crowds), the second cynophobia (fear of dogs), the third hydrophobia (fear of water) and the fourth acrophobia (fear of heights). Equinophobia (fear of horses) is one phobia that crops up frequently as well, with stories of girls who lose their nerve after riding accidents. Hettie Horse-Hater and Rona Rides Again (Tammy) are among them. But at least in these stories the heroines know what their fears are. This is not the case with Clare Harvey, who has no idea what these waves of fear are that keep gripping her, and nobody seems to understand what explanations she can manage to give – that she just gets seems to get scared and sees that cave everywhere. But we can see that whatever it is that is overwhelming Clare, it is not cowardice or bad conduct. There can be no explanation for those swirls and flashes around Clare’s head and the inexplicable panic attacks but insanity of some sort. But neither Clare nor the reader knows or understands what it is (except maybe the readers who know about claustrophobia), which makes it all the more terrifying. And neither the parents nor school staff are picking up the clues; they are all being too judgemental and harsh because they are all acting on the assumption that Clare is a coward who is becoming badly behaved and violent. But nobody tries to find out why Clare is acting this way, although the headmistress is at a loss to explain why a model pupil with a good school record is suddenly acting so out of character. We wince at the increasing harshness of the parents towards Clare. They even go as far as to show more sympathy to the bullies than to Clare. They call them “poor girls” when it was their fault for bullying Clare and nearly killed her, and also say they cannot even blame all the girls at school for hating Clare. They don’t even consider taking her out of the school. But really, bullying is bullying. The parents’ attitude is made all the worse that these are supposed to be loving parents (unlike some parents we have met in other serials). Neither the parents nor the school authorities take any action on the bullying, though they know about it (unlike the parents and school staff in “Tears of a Clown“) and the father even foresaw it. The only adult to act with any sense is Miss Heath, who, unlike the others, has not reacted judgementally. It just goes to show that taking a step back and trying to look at things in perspective instead of reacting emotionally can make all the difference. Such things happen so often in girls’ comics. All too often you see adults handling a girl badly in a serial because they act out of ignorance, stupidity, lack of empathy, or bad reactions. Often, though not always, it takes a wiser person like Miss Heath to help put things right. You have to wonder if the writers are trying to make a statement about what NOT to do and what you SHOULD do. “White Horse of Guardian Hill” and “Tears of a Clown” are two Jinty examples. Non-Jinty examples include “Hard Times for Helen” (Judy), “Rona Rides Again” (Tammy), “‘I’ll Never Forgive You! '” (Bunty), and “The Courage of Crippled Clara” (Bunty). Seldom have girls’ comics explored the issue of mental illness, but this one does. And it is a complete reversal of the usual thing in girls’ comics, where a girl is labelled ‘ill’ when she is in fact under the influence of something or telling the truth about something but nobody will listen to her, such as in “Village of Fame“. But in this case, being ill is the correct assumption, yet nobody except Miss Heath can see it for what it is because their perceptions have been warped by the wrong assumptions. The issue of mental illness is handled in a sensitive, well-researched and written manner that delivers a disturbing warning on the damage authorities can do when they act on assumptions, emotion and quick judgements instead of trying to handle things in an investigative, non-judgemental manner. This is one Jinty story that will linger with you (me anyway) long after reading it because of the issues it explores are issues that are still all-too-relevant, because even today people can make the same mistakes and errors of judgement as the parents and school staff do in this story. This was not the first Jinty story to have a girl being wrongly branded and bullied as a coward because of a phobia. In 1977, Jinty ran “Cursed to be a Coward!”, where Marnie Miles, a brilliant swimmer, develops intense hydrophobia because a fortune teller frightened her with a prophecy that she will end up in blue water. Marnie thinks this means she will drown. And the fortune teller is out to oblige, by making several attempts to drown Marnie. But Marnie’s classmates don’t understand this and start calling her a coward on top of her other problems. Is it possible that Cursed to be a Coward and Waves of Fear had the same writer, or the former influenced the latter? There are similarities between the stories; two girls are wrongly branded cowards and become targets of bullying because of phobias, and the incidents that caused the phobias are both related to swimming. There is even an incident in the opening episode of Marnie’s story where she fails a drowning person because her phobia is too strong for her to go to the rescue. A foreshadowing of what happens in the cave? Waves of Fear also has similarities with Jinty‘s 1980 story “Tears of a Clown“. Both stories deal with bullying situations where the school and parents keep failing the girl because they are all making assumptions that she is the one at fault with bad behaviour instead of looking into the situation in an investigative manner and find out what is wrong. And in both stories, the bullies turn on the ringleader at one point, although she protests (with some justification) that they are to blame as well. Both stories climax with the heroine being pushed too far and running away. And running is a major plot point in both stories. So it is possible it was the same writer. It certainly was the same artist – Phil Gascoine drew both stories. Perhaps the reception to “Waves of Fear” was inspiration for the similarly-themed “Tears of a Clown”. But there is a difference in the way the ringleaders react when the other girls turn against them; the one in “Waves of Fear” becomes even more spiteful while the one in “Tears of a Clown” repents and eventually redeems herself. Incidentally, “Waves of Fear” was reprinted in Girl Picture Library 11 as “Moments of Terror”. Plenty of old serials from Tammy and Jinty made their way into the Girl Picture Libraries, most of them under revised (and not very good) titles. As the story had to fit into a 64-page booklet, some material had to be deleted. When comparing the original with the reprint, one finds that the Miss Heath segments have been cut out entirely. This leaves only the revelation of how Jean got Clare expelled as the cue that tips the parents as to what is wrong with Clare. On the other hand, the cuts also removed some of the harsh treatment Clare receives from her parents and all the ostracism from the townsfolk. Some of the bullying (such as Clare finding an egg in her desk and Jean being sent off for fouling), Jean’s vandalism at the orienteering club, and one of the claustrophobia attacks have also been removed. Addendum Recently I have been struck by parallels with another story, a Button Box story that appeared on 27 August 1983. The story is an American Civil War story about Johnnie Dalton, who is dishonourably discharged from the Army for cowardice when he panics under fire. Back home, Johnnie is treated extremely harshly. He is branded a coward and an outcast, and even his own father turns against him, to the point of forcing him to wear buttons that read “COWARD”. Eventually Johnnie regains their respect when he saves a child’s life, but loses his own in the process. It may be coincidence, but the harshness of the community and Dalton Snr towards Johnnie seems to have echoes of the harsh treatment Clare receives, even from her own parents, because they have both been branded cowards. And credits say the Button Box story was written by Ian Mennell. Is it possible that Ian Mennell wrote “Waves of Fear”? Or could it be the same person who wrote another Gascoine story for Jinty, “The Green People”, as Jean has the same surname as the heroine in this story? Another of my favourite covers. The panel from the Gypsy Rose tale of haunted woods, warning owls and the eerie, supernatural ambiance is one that lingers with you. The lightning-shaped panels that separate the three images are another hint of what might happen in the story and certainly heighten the mood. The panel with the lavender doll seems a little out of place. Its theme is such a contrast to the supernatural theme. However, the colour composition is a nice use of complementary colours that work well against the colouring in the supernatural panel. The Gypsy Rose tale is one about listening to your dreams because it can make all the difference. And note the Gypsy Rose image on page one, panel 7. That image is going to be used as a paste up for future Gypsy Rose stories. This week’s Fun-Bag story features workplace bullying. Sue’s friend Linda has just got a job, but the office head Miss Jones bullies her all the time. The boss had been putting up with that bully for years, but after Henrietta steps in, he finally does what he should have done years ago. Workplace bullying also causes Made-Up Mandy to don another disguise to help a fellow worker, Nikki. A bully customer has accused Nikki of stealing and got her sacked. Mandy’s now posing as a Balinese dancer to raise much-needed money for Nikki. But can you do Bali dancing, Mandy? The daily bullying that poor Emma Fielding suffers because of the so-called Mark of the Witch turns into something far worse. Emma tries to put out a fire, but those Kettleby villagers, always willing to believe the worst of her, accuse her of starting it. Their mood is ugly and we’re warned there’s going to be a lynch mob! In The Mystery of Martine, Tessa tries to explain what is happening to Martine to the playwright, but he doesn’t believe her. And the harassment from Vivien’s possession of Martine is wearing Miss Bond down while a blackmailer is getting ready to add to Tessa’s worries. Willa tries to help a fellow patient but, because she can’t walk properly, falls and knocks herself out. The patient could be severely affected by the delay caused by Willa not having just called for help while she could… I have sympathy with the exasperated hospital staff, but the fact they brutally say “you’re incapable of helping now” is rather too strong; it leads to Willa abandoning everything about her life as a nurse, including her old uniform which sinks symbolically into the mud. It is the New Years issue, but not in the new year of 1978. As you can see from the date, Jinty is still on the old year of 1977. New Year goodies include part one of a pull-out Jinty calendar, and it’s resolution time in Alley Cat. Spotty Muchloot resolves never to let Alley Cat give him the run-around again. He starts off his resolution by giving Alley Cat a bashing while wearing protective gear. But Alley Cat gets the last laugh on Spotty, as usual, and Spotty resolves never to make new year resolutions again. Sounds like a resolution that is more sensible and easier to keep! The first (Phil Townsend) story for 1978 is Waking Nightmare. It starts in the next issue, replacing White Horse of Guardian Hill, the Jinty story to finish on the last day of 1977. But it will be a while yet before we see other new stories in 1978. The current ones are still going strong and Darling Clementine is only on its second episode. “Willa on Wheels” is one of those stories where everything is psychologically mis-handled (surprise). After having had the accident which put her in a wheelchair, Willa continues to think of herself as a nurse still, but the hospital is not set up to have a wheelchair bound nurse, let alone one who is supposed to be a patient rather than a staff member. The staff handle the mental transition that Willa needs to make in a very inept way, needless to say, and Willa herself is not being very sensible about it: risking some patients’ lives on the way. I have not mentioned “Horse From The Sea” much in these issue posts, as it isn’t a story that I remembered very strongly from the time. It is a mystery story with the eponymous horse from the sea cast in the role of magical helper: in this issue we hear the tale of how it appears every time the heir of Penrose is in danger. The mystery is that the heir is, supposedly, someone other than the protagonist, and yet it is to the protagonist that the horse is appearing… The art, by Comos, is beautiful, but the story is only so-so, I feel. This is the penultimate episode of “Then There were 3…“: the last two brave girls are captured by the criminals and are told all their plans – because it is not expected that they will be found again to tell the tale to the authorities!